There are many choices for TPO membranes. Only EverGuard Extreme® TPO offers superior performance over "standard" TPO membranes and the industry's best guarantee: up to 35 years! Specifically, this patent-pending technology delivers next-generation performance against heat aging and UV degradation (the two key performance characteristics directly related to roof system longevity),and also exceeds all key ASTM standards for TPO membranes. Don't settle for standard TPO when you can get the advanced protection of EverGuard Extreme® TPO for your property. When you're looking for great performance in a value-priced TPO roofing system, look no further than classic EverGuard® TPO. 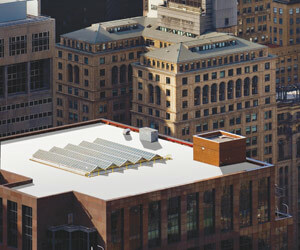 It's perfect for new construction or re-roofing where superior performance is required at a cost-effective price. It features the same great performance that all EverGuard® products offer—exceptional seam strength and puncture resistance, superior long-term weathering, and easy installation—for maximum reliability. Call Bella Vista General Contractor today for a free estimate on GAF Everguard® TPO roofing systems.